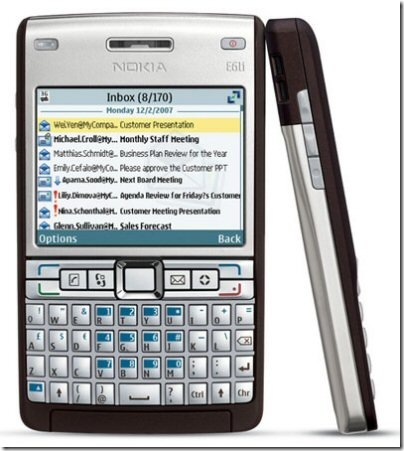 Nokia E61i which comes under Nokia E series is a smartphone that is primarily aimed at business users. The phone is powered by Symbian OS 9.1 Series 60 3rd edition which is one of the largest mobile operating system that powers many phones. Nokia E61i is an upgraded version which sports a 2.0 megapixel camera and some minor enhancements over the earlier E61 which was popular phone. The Nokia E61i is a truly business class phone as it offers full QWERTY keyboard with backlight and offers all the possible connectivity options like Wi-Fi, Bluetooth, Infrared, GPRS, EDGE , 3G and USB ver 2.0 support. The Wi-Fi part is one of the best it supports 802.11b and 802.11g protocols which establish a maximum of 54Mbps speeds. With this phone you can easily browse through the internet as you sip your coffee in a coffee shop or use it in airports for checking your e-mails. The full QWERTY keypad eases typing those long e-mails which you would have to send, we found it very easy use with solid feel of the keys. Nokia E61i sports a large 2.8″ QVGA with 320×240 pixels resolution which is pretty good and displays images colours crisply, so next time you need to work on or read a document then your eyes would thank you for choosing this phone. This phone also doubles a multimedia device that can keep you entertained as well with Music player, Video player and the built in 2.0 Megapixel camera that can take average photos this not that bad for a business class phone. The total combined memory (shared + SDRAM) comes to 124 MB which is good enough for your day today usage and moreover it also supports microsSD. The built in Nokia web browser does a wonderful job by rendering websites pretty quickly. We used the EDGE and Wi-Fi for browsing which we found were pretty satisfactory but we felt that the EDGE was pretty slow, which we think is due to Vodafone’s poor network in India. But the Wi-Fi browsing was really amazing as we good see the page load time to be pretty quick. Since this phone is powered by Symbian OS there are loads of free and paid applications that you can use to enhance the functionality of this phone. There is no flash for present so taking pictures in Dim light is going to be little tough. The bundled 2.0 megapixel camera looses its charm owing to no flash. We strongly feel the need for a flash or alteast a photo assist light that would help take pictures in dark. Nokia E61i uses Bluetooth Ver 1.2 and does not support A2DP profile hence you cannot use the stereo Bluetooth headsets with is phone. The phone does not have a front camera for Video calls even though it supports 3G networks, so you may have to buy a separate video stand for making video calls. The phone uses pop-port for the connecting wired headsets but we would like to see 3.5mm jacks which would allow one to use the headphones of their choice. This phone is a solid messenger phone which is one of the best value for money deal for business class users. This phone can give lower end Blackberry phones a run for their money as it offers all those features that too in price range of Rs 16,500 (USD $420) in Chennai. If you can live with these minor setbacks it offers then this is the phone for you. Bạn hãy bôi mật ong lên mụn và giữ trong 15 phút. also get involved in visitors’ ｒesponses like this. Should a position regarding guest writer become available at your end, mɑke sure you let me know.